A pregnant teenager died in a suicide by asphyxiation at Connecticut’s psychiatric hospital for children just one day before she was supposed to be discharged and sent to a foster home, according to state Department of Children and Families officials on Tuesday. The 16-year-old’s suicide late last Thursday night at the South Campus of the Albert J. Solnit Children’s Center in Middletown occurred despite staff checking on her at 15 minute intervals, which is required by the facility’s protocol, DCF officials said. The teenager’s death has prompted inquires from DCF, the Department of Public Health, the Office of the Child Advocate, and the state police. The facility is operated by DCF. DCF officials said there had not been any suicides at the facility prior to the teenager’s death. Officials said they are greatly concerned about the contagion effect it could have on other children at the center, and are offering counseling and support to all of the children who may have known the girl, as well as other patients at the facility. The 16-year-old’s progress in her treatment meant she would have been discharged from a transitional program known as the Psychiatric Treatment Residential Facility (PRTF) and sent to a foster home one day later. She began treatment at the facility in February, 2018. DCF officials said that, based on what the department knows at this point in its investigation, the teenager displayed no previous expressions of intent to harm herself, and there were no self-injuries or warnings indicating she would take her own life. The department said that although its internal review is ongoing, there is no indication at this point that any facility staff failed to do their jobs appropriately. DCF said it has already taken measures to improve how it responds to and prevents suicide attempts, including placing medical equipment like oxygen tanks and suction devices directly on each unit at the hospital and the PRTF. On Tuesday, it changed its procedure to include a random check of all youth in addition to its 15-minute observation schedule. Cameras will also be placed in the hospital halls and PRTF units to improve monitoring of children at the facility. The psychiatric facility updated its suicide prevention and medical assessment plans three months ago, following a public health inspection that identified issues with the facility’s handling of two suicide attempts. DPH inspectors found “serious deficiencies” in the facility that placed residents in “immediate jeopardy,” according to an April 9 report. During the March 23 inspection, the DPH’s Facility and Licensing Investigations Division found gaps in the hospital’s medical treatment for injuries and the education and training of its staff, the survey said. Specifically, the inspection scrutinized staff members’ supervision of two suicidal residents. On one occasion, the public health inspectors said that the staff “failed to provide an appropriate level of supervision” to a resident who attempted to overdose on medications. 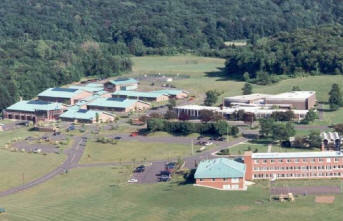 Inspectors also found that, in its handling of another patient who attempted suicide by wrapping scarves around the patient’s neck, the psychiatric hospital did not meet the requirement that states “a resident will be transferred from the facility to a hospital and admitted in a timely manner when a transfer is medically necessary for medical care or acute psychiatric care.” Instead, according to the DPH report, staff members and supervisors cut the scarves loose with scissors and decided that the resident did not need to be transferred. The facility submitted a plan of correction shortly after it was notified of the inspection results. That plan included increased training for staff on suicide prevention and updated medical assessment and treatment procedures, among other adjustments. The plan was approved by the DPH Facility Licensing & Investigation Division, and the “immediate jeopardy” status was lifted April 13. DCF officials said Tuesday that the prior DPH findings are not relevant to this tragedy, considering that all of the issues DPH identified in March were addressed well before this death and none were present on Thursday. Alyssa Hurlbut Alyssa Hurlbut is The Connecticut Mirror’s 2018 Bill Cibes Journalism Summer Intern, named after long-time CT Mirror board member Bill Cibes. She is the Editor of The Circle, the student-run newspaper at Marist College, where she is a rising senior. Her previous journalism experience includes roles as a research assistant for PolitiFact in Washington D.C. and a reporting intern at The Journal Inquirer. She also worked at Hartford-based Partnership For Strong Communities writing affordable housing case studies. Alyssa is pursuing studies in journalism and political science at Marist.